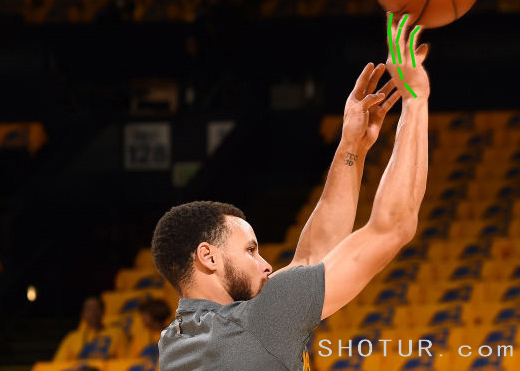 Hi, I am Shawn He, this post I will show you two new basketball shooting hand types: tough hand and soft hand. In this post right hand player as an example, if your are left hand player, please replace the right hand to the left hand to understand the theory is the same. 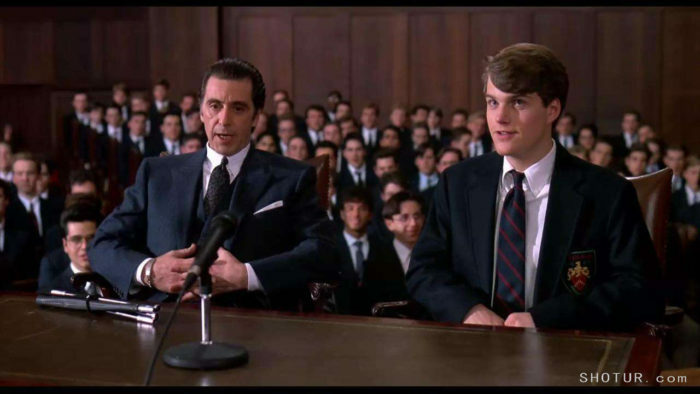 The elite rate doesn’t exceed 10% in whatever industry. 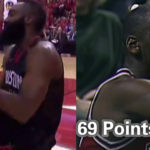 So does in basketball world. There are more than 100 million people playing basketball, but seldom ones have the top-level basketball skills. 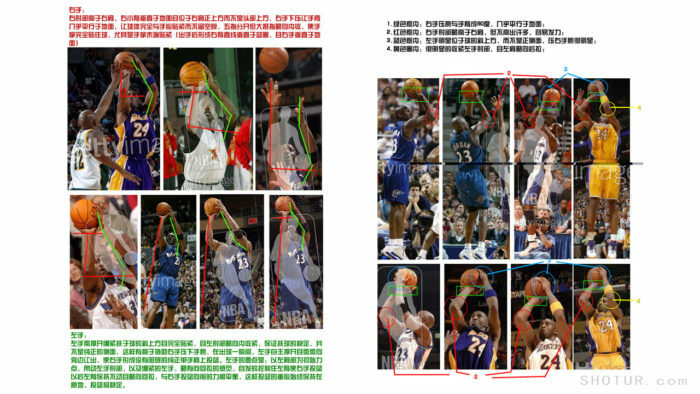 The top-level players such as Michael Jordan, Kobe Bryant, Stephen Curry, Ray Allen and etc. 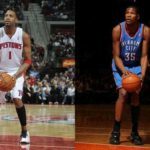 are at the peak of the basketball world not because they have the amazing gift, but because they master the most advance basketball skills and they practice hard via scientific training methods. 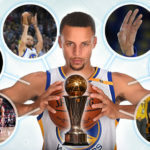 No matter what industry you are in, once you are more insightful than others and you master more advanced technology than others, you are more likely to be on top and achieve more accomplishments, for instance, Michael Jordan and Stephen Curry, both of them stand out from others due to their mastering of more advanced basketball skills and thus they led their respective teams to get the NBA final championship. yourself. 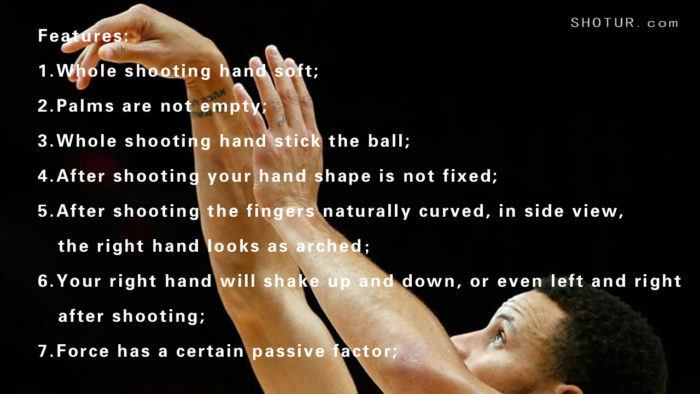 Next, today I will introduce the most advanced basketball skills I’ve mastered to you. easier for you to have more advanced technique, more psychological advantage and more rational confidence. 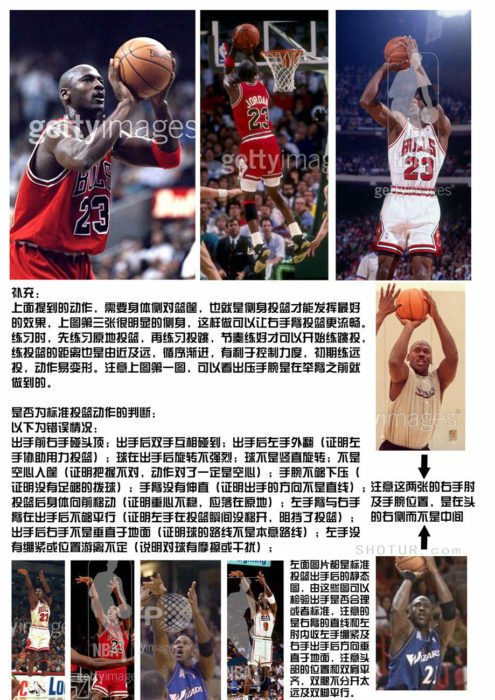 Almost all basketball players only master one kind of hand type which they are good at and they can score steadily by it. They are more likely to negate other hand types, but actually it is just a matter of perspective because we are intended to judge based on our own cognition and negate what we are not familiar with. 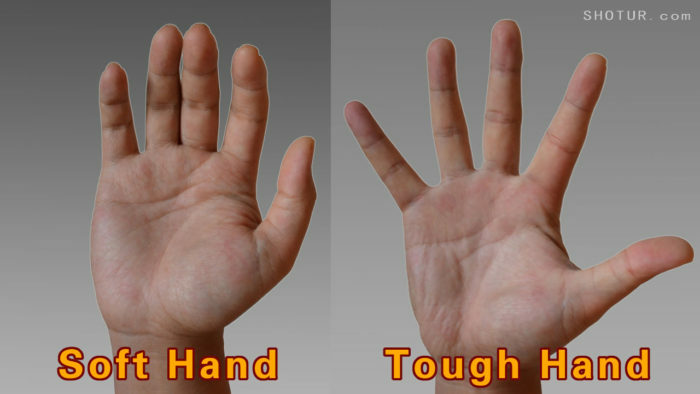 fact, there are two mainstream hand types instead of one type as many people think, that is, tough hand type and soft hand type. This article is just a brief introduction for both tough hand and soft hand types, later other articles will be made to explain usage and technique of them in detail. First let’s talk about tough hand type, which is widely used by inside players and players having strong hang capability. It can keep the ball steady and resistant to disturbance. 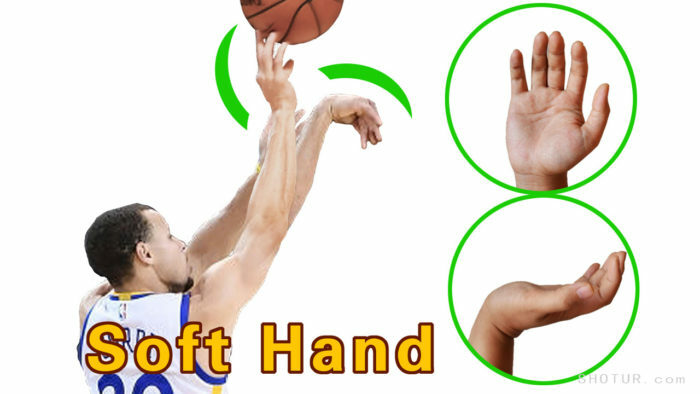 With this hand type, you can shoot any time before you land, so you have a lot of timing to shoot and it can keep a good hit rate also. 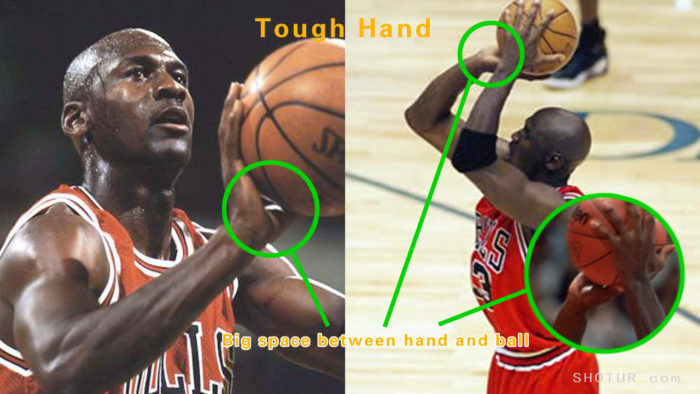 Michael Jordan, Scottie Pippen, Kobe Bryant, Hakeem Olajuwon are representatives of using tough hand type, they mostly shoot in medium distance from the court. 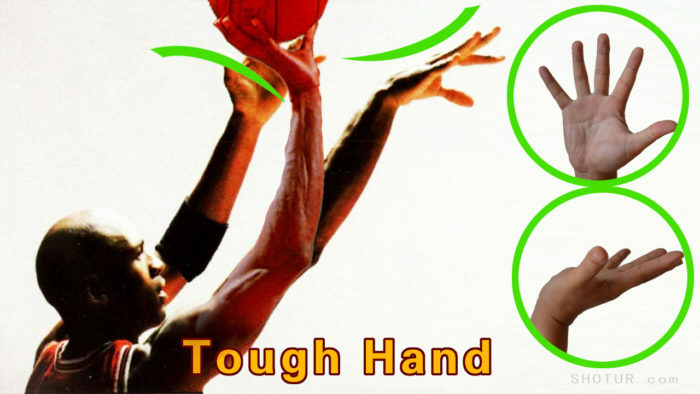 The feature of tough hand type is that the whole hand is rather stiff, after shooting the right hand will not shake up and down with big magnitude and high frequency, it will fix with the momentary motion of finishing shooting. In side view, the right hand looks like the bottom of a bowl or an arc, some look like an eagle paw. In a word, the biggest feature is stiffness. From wrist to every finger, all the right hand is stiff. So, there is not much swinging after shooting. distance. 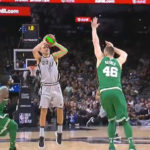 Especially in crucial times when player body is very tense, it conforms with tough type requirement very much so at this moment medium distance shooting made by tough hand type players is better than normal. Its shortcoming is that if shooting from a long distance or a very long distance, the force is not enough, the arc is not very high and the shooting velocity is ordinary also. 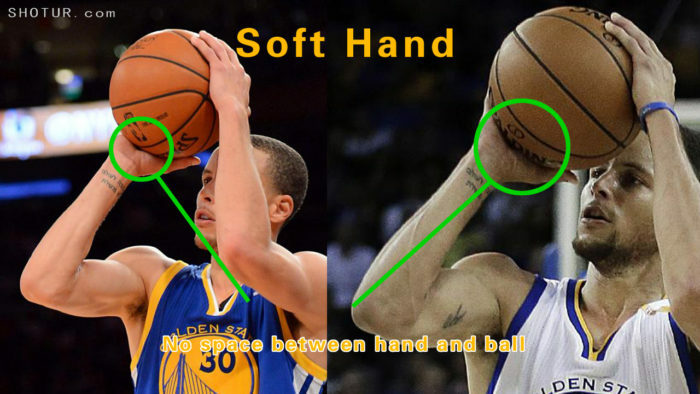 The soft hand shooting type representatives are have long shot tendency, such as Stephen Curry, T-mac, Steve Nash ,John Stockton ,etc. 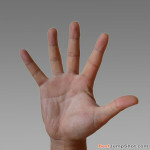 The feature of soft hand type is that all the whole right hand is soft. There is no fixed hand types. 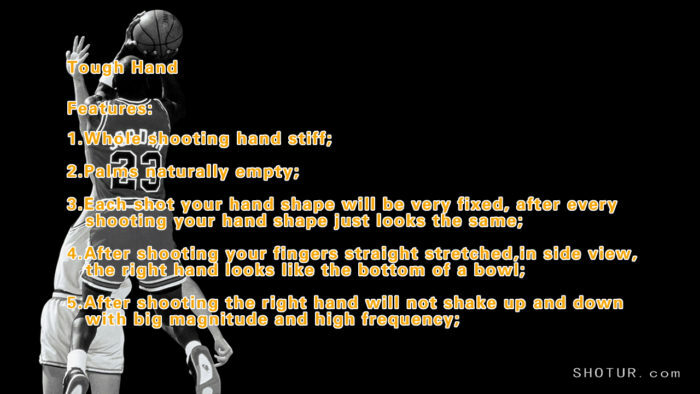 After shooting, the right hand will become loose so it will shake up and down, or even left and right. In general, the form of the right hand after shooting is it dangles softly and completely with five fingers splitting apart and dangling spontaneously. The advantage of soft hand type is that it is easy to shoot with less force, easy to make 3 points and even easy to make shots with a rather good hit rate in middle circle area. 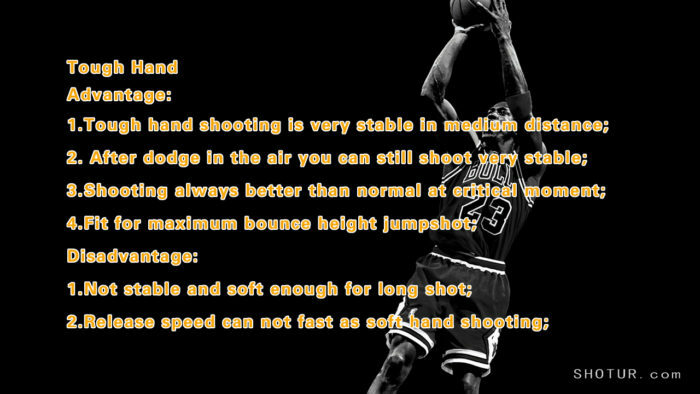 Soft hand shooting has a good arc, a high revolving speed and a fast shooting speed. But, compared with tough hand type, it is less resistant to disturbance and not good either when shooting after hanging in the air. What’s more, it needs relaxation, so in tense moments, you performance may be not so good. 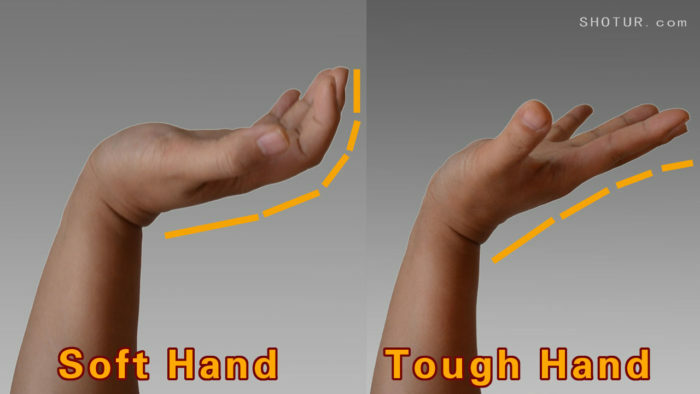 So these are the notions about soft hand and tough hand types. After you master them, you can clearly distinguish different shooting types and their pros and cons. More importantly, we need to master these technique flexibly, not stubbornly. 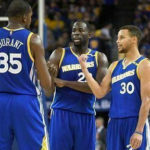 You need to combine them with your shooting and improve your shooting skill according to your own playing characteristics or goals. 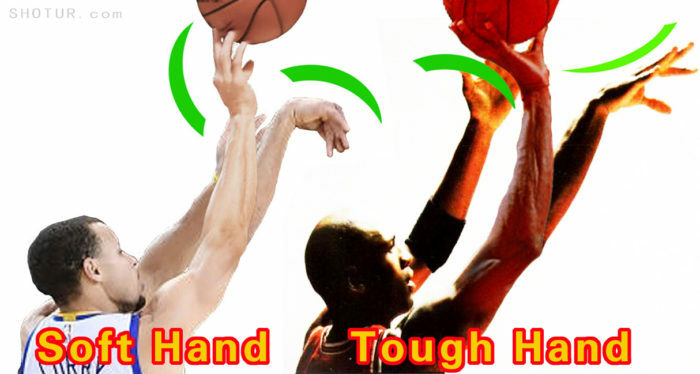 Many players such as Anthony, Irving use them based on their essentials, that is, use them selectively instead of solely, we often call it medium tough hand type. Likewise, you can practice flexibly after mastering their notions. 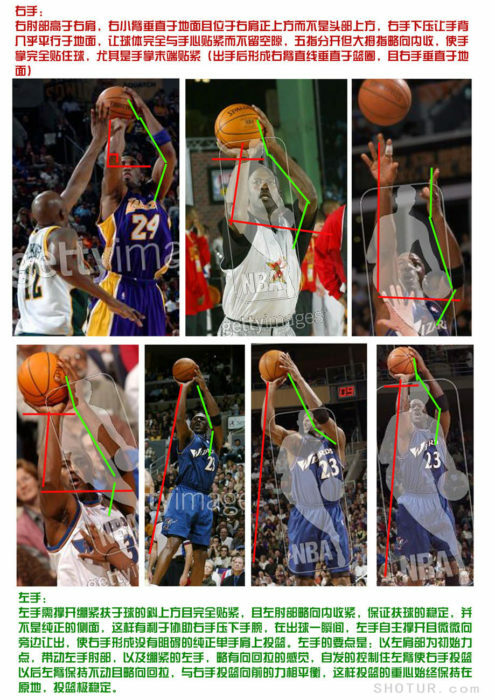 straight theory about basketball shooting. Since then, I started another ten years career of practicing and researching shooting. During this period, except in holidays and being sick, myshooting training more than 2 hours on average everyday, even in days with heavy snow, rain and strong wind, I never stopped. 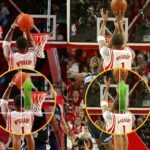 I kept on testing and verifying my basketball theory and the help and negative effect force exertion from different body locations brought about. 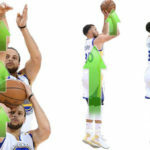 I checked on the internet and found that there was no similar pics or articles before, that is, using circles and boxes with different colors to mark different body locations to explain basketball skills. 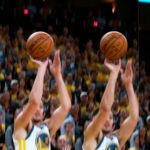 Before, most basketball players insist that shooting technique can’t be explained in detail, but I did through effort of ten years to show the shooting skills in words on my website. 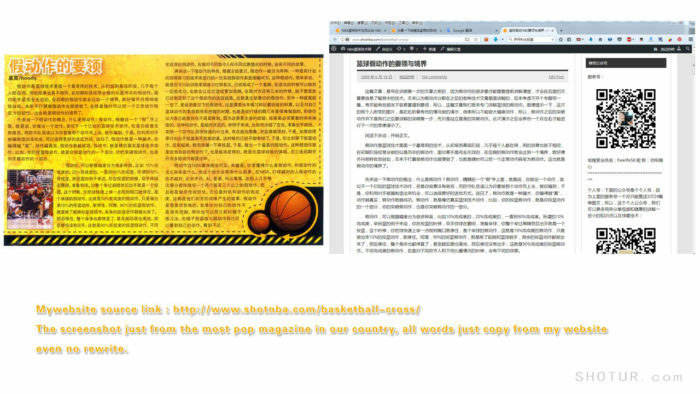 To keep focus on practicing basketball and avoid disturbance, after the several pictures, I established the website shotnba.com and its corresponding English website nbahoop.org(now closed) and I synchronous updated in my football website fifalife.com(now closed) to make more friends to have convenience to learn my shooting experience directly from websites. conservative. 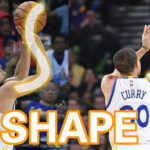 Why I establish shotnba.com is to stimulate skillful basketball players to share their advanced experience. When I was about 11 years old in 1991, I hoped I could learn the basics from a coach, but no opportunity, so I had to ask help from skillful people around me, but they also told me shooting couldn’t be explained in words. I had to watch TV and read magazines in hope of finding scientific shooting method, I even bought textbooks about basketball, but I still couldn not find detailed shooting skill explanations. 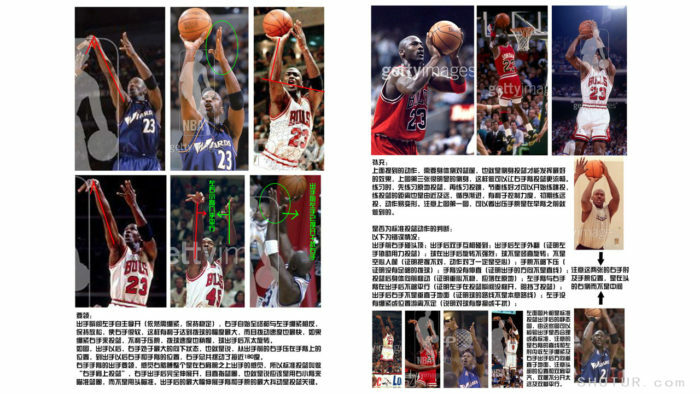 Eventually I tried to improve my shooting according to Michael Jordan’s videos and magazines. 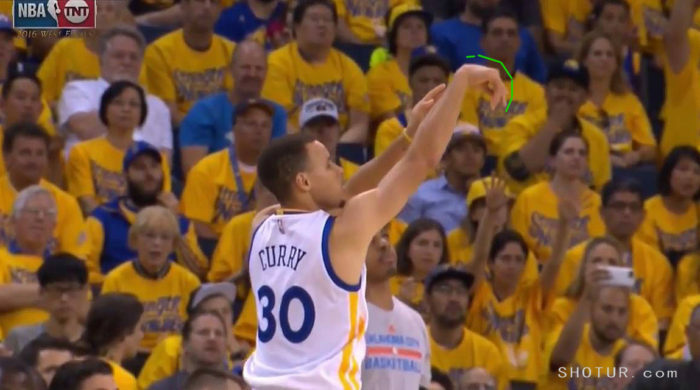 Those years were really tough, many shooting motions looked similar, but they have different force exertion methods. 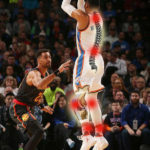 So, I established the website shotnba.com to share with visitors liking playing basketball my most advanced theory and technique, my effort and experience through 20 years of practicing. I do hope young friends don’t need to suffer the hard practicing times I have gone through. 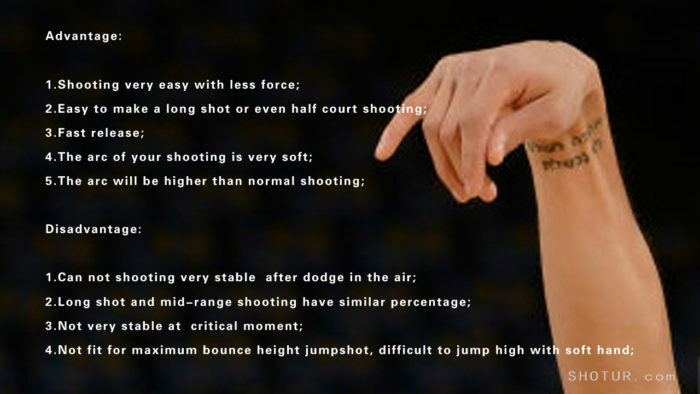 If you can understand the original theory from our website—-soft hand and tough hand and theory about straight line force exertion, you will master shooting skills more easily, thus leading your practice. 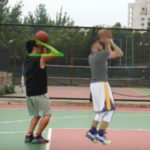 During the ten years, more than 1 million people have learned shooting skills from our website and many friends got a remarkable improvement, I am so happy about this and glad to see the shooting improvement videos and game videos shared by these friends. 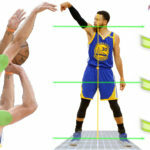 In the past ten years, we have refined shooting skills to almost every body location, including five fingers, wrist, eyesight, head, elbow, forearm, right hand, left hand, waist, knees and foot positions.I have researched more than 5 NBA superstars’ shooting characteristics and rationality in past 12 years, every shooting type I always researched more than 1 year: Michael Jordan 5 years, Steve Nash 1 year, Tracy Mcgrady 2 years, Ray Allen 1 year, Carmelo Anthony 1 year, Stephen Curry more than 2 years. 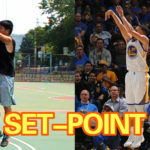 I will continuously update my shooting skills and experience from the past ten years on shotur.com , youtube and etc. 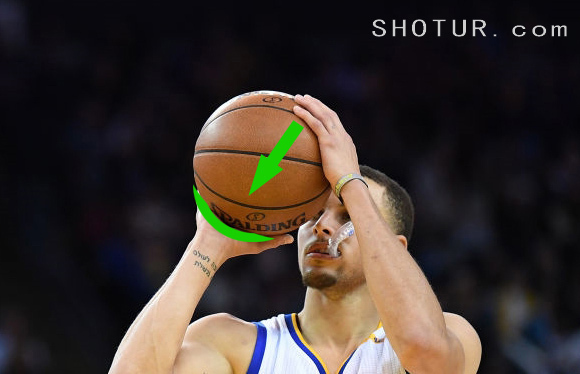 If you don’t want to wait, you can click our website shotnba.com, then click the translation button to translate to your native language to learn our most advanced shooting skills. 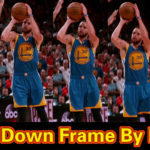 During my ten years of basketball teaching, many friends learned important technique from our website shotnba.com, at the same time, the contents of our website are reposted by other websites from time to time. So herein I declare that all our articles and theories are fruits through my effort, hardworking and persistence in basketball courts and I do hope everyone can cherish my achievement, do not pirate. Any magazine or media charging fees is prohibited to repost without author’s consent. But, in the ten years, there are different kinds of websites and medias pirating our articles, even using signatures of other unknown persons. As for this, We express strong opposition and denouncement. So, herein I hope all of friends having learned skills from our website, if you find behaviors of pirating our articles in different websites or medias, can help us to denounce this kind of action and protect our copyright and legal rights and interests. 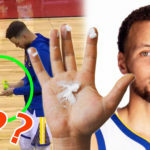 15 years basketball shooting research experience, in clude Michael Jordan hard hand shooting form 5 years, Stephen Curry soft hand shooting form 5 years, Tracy McGrady 2 years, Ray Allen 1 year, Kyrie Irving 1 year, Steve Nash 1 Year. Dont worry, I will publish it at shotur.com. Chrome has the function which can translate all articles into English!